Will there be waste collection services on holidays? For information on waste collection services on holidays, please see our Holiday Waste Collection Schedule page. What is the difference between a commercial dumpster and a roll off dumpster? The size and function are the primary difference between the two types of dumpster. Commercial dumpsters can be used to dispose of regular waste (MSW), recyclables and organic wastes which include green (yard) waste and food waste. Commercial dumpsters are smaller, ranging from a 2 cubic yard to and 6 cubic yard dumpster. These are the dumpsters you typically see behind a business complex, gas station, restaurant, apartment complex, or other businesses that need permanent scheduled services. Such services are almost always scheduled anywhere from once every other week to seven days per week. Roll off dumpsters on the other hand are larger and generally hold anywhere between 10 cubic yards and 40 cubic yards of waste. They are generally used for temporary needs such as a home remodel project, garage clean out and construction related projects such as building and demolition of roads, homes and office spaces. Roll offs get their name because they “roll off” the back of a truck when delivered to customers. How do I determine which dumpster size is best for my project? If you are a business owner and you seek scheduled weekly services on a permanent ongoing basis then you need to schedule commercial dumpster services. If you are seeking dumpster services on a temporary basis for a clean out, home remodel, construction project or any other temporary project, then a roll off dumpster is the correct choice. Ensuring you select the correct dumpster size for your project can save you time and money. A dumpster that is too small will cost you more by requiring you to schedule additional hauls to remove all of the debris while a dumpster that is too large will cause you to incur initial unnecessary expenses if a smaller one would have been enough. Please see our dumpster dimensions and sizes to help you select the best dumpster for your needs. Please note that each cubic yard will hold roughly 15 (thirteen gallon) kitchen-sized trash bags or about 6 (thirty gallon) large trash bags. Please feel free to contact one of our customer service representatives at 734-274-4124 for additional help in selecting the right dumpster for your project. To order a permanent commercial dumpster, simply enter your zip code for vendors in your area. Select the appropriate commercial dumpster size and complete the requested information. An Arwood Waste customer service representative will contact you with a quote and to complete your order. 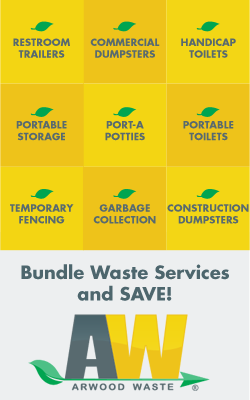 To order a temporary roll off dumpster, simply enter your zip code for vendors in your area. Select the appropriate roll off dumpster size, request a quote. Or directly contact one of our Arwood Waste representatives for a free quote at 734-274-4124. A full roll off dumpster can be very heavy depending on its size and the type of materials that are placed inside the container. Thus, we highly recommend customers take any necessary actions to prevent any potential damage to driveways and pavements by placing a 4’ x 8’ sheet of plywood on the driveway where the container will be placed. The customer affirms that any right-of- way provided by customer (disclosed in delivery questions) for the roll off container is sufficient to bear the weight of all contractors’ dumpster equipment and vehicles required to perform the contracted service. The customer assumes all liabilities for damages to private driving surfaces, pavement or road surfaces and entire roll off container placement site. The Arwood Waste and its affiliates shall not be responsible for any damages to any private driving surface, pavement or accompanying subsurface of any route associated to perform the service that was contracted. What items are not allowed to be placed inside the dumpster? Hazardous waste, dirt, industrial waste, chemical products, radioactive material, oil filters, herbicides & pesticides, solvents, paint (except completely dried latex paint cans, no liquids), other flammable liquids, aerosol cans, propane tanks, motor oil, transmission oil/lubricating/hydraulic oil/oil filters, contaminated oils (mixed with solvents, gasoline, etc. ), antifreeze, petroleum contaminated soil/lead paint chips, tires, appliances, fluorescent tubes, batteries, computers, monitors, televisions, microwaves, railroad ties, medical waste, asbestos, animals, barrels and all liquids. Material must be level at the top of the container; nothing can be sticking out of the top. Additional requirements may apply based upon locality. The liability for appropriate waste remains with the customer as agreed to in the terms and conditions when contracting with Arwood Waste. Can I rent a toilet for just one day? Will the toilets be clean for my event? To ensure Arwood Waste can provide you with the services you need, we ask that you contact us at least 2 days in advance of your event. For large special events or job sites, a week or more lead-time is encouraged. However, if you require same day delivery, Arwood Waste can accommodate you. Contact Arwood Waste as soon as possible to report the incident. We will then dispatch a driver to come to the site to clean the unit or provide another unit. We will make the necessary adjustments depending on the situation. Arwood Waste offers portable wheelchair restrooms that are ADA compliant for use on your construction site or special event. ADA units are large enough and obtain the proper elements to meet the standards that have been outlined by the Americans with Disabilities Act. For a complete set of ADA guidelines relating to portable restrooms, please contact Arwood Waste. Arwood Waste will place your units at your event or job site per your instruction. They will make every reasonable attempt to accommodate your desire for specific placement on the unit. However, we will relocate the unit and notify you if it becomes necessary, so that we may service the unit safely. Arwood Waste have highly trained employees that will not only pump out the holding tank, but will clean the inner bowl of the unit and provide thorough janitorial service inside and out of the unit. They clean and sanitize the portable restrooms at each service, as well as provide a special sanitizing detergent in the water that also acts as a deodorizer to keep the unit smelling pleasant while reducing your exposure to germs. Our pricing is straight forward and clear. Cost is dependent on how long you keep the unit and your choice in where to store. Please visit our Free Quote form to request a customized quote in your hometown. How long can I use your service? What if I only need it for a few weeks? The beauty of our portable storage options is the flexiblity you have for your storage needs. Whether it’s a short term weekly rental or a longer term monthly storage need, we can service your request today. If you choose to store on site, your unit is available to you 24 hours a day, 7 days a week. If you use our Storage Center, simply give us 24 hrs notice for an appointment to access your unit – as often as you need. We can also deliver your unit to you whenever you need it on site. I don’t want my things to be damaged. Where will my unit will be stored? Our Storage Facilities are secure and climate controlled for both temperature and humidity. Coupled with our 24 hour surveillance, your items will be both safe and protected from damage and loss. Request your free quote and place your order today. Your unit can be onsite and available from 24 to 72 hours. Do I need to be there when the unit is delivered? Yes, someone over the age of 18 needs to be where the unit is to be placed. When the unit is delivered, your driver will go over all the paperwork and show you how to properly use the unit.